There are certain health requirements that CMV drivers must meet in order to maintain their commercial drivers license. Each driver should pass a DOT physical examination with a certified medical examiner every 24 months to be eligible for a DOT medical certificate. When it comes to DOT physicals, blood pressure is a frequent concern for drivers. The purpose of checking blood pressure during a DOT physical is to ensure a CMV driver is capable of doing their job safely. With so many risks associated with hypertension, CMV drivers with healthy blood pressure are vital in keeping our roads safe. 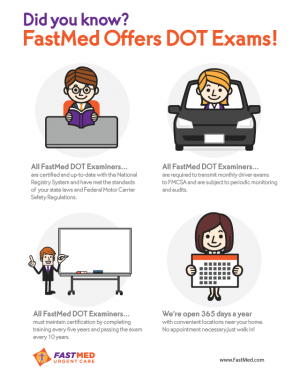 FastMed offers affordable DOT physicals and blood pressure tests by certified medical professionals who are available day and night, 7 days a week. To make it even easier, FastMed now has an online check-in option and discount programs.